A Fairy Friend by Sue Fliess, illustrated by Claire Keane. Holt Books for Young Readers, 2016. As soon as school lets out for summer break, I enter my goofy "all-whimsy, all-the-time" stage. I'm ready to build fairy houses (large and small), celebrate Midsummer and International Fairy Day, and indulge in fantasy movies and books and crafts. (See Pinterest, too - here and here.) I don't like the heat and humidity and mosquitos, so I have to find something sweet to get me through Kansas summers. We're off to a sluggish start. School let out a week ago, and late May has been a stormy wet one. Little Sis went on a weekend camping trip with her Scout troop, and came home sick. We're trying to get the girls' bedroom and playroom reorganized and cleaned up, and we're progressing at a snail's pace. We will take a break tomorrow to see Alice Through the Looking Glass with Little Sis's BFF and her mom and, weather permitting, we may have something fun planned for Saturday. I'm in rehearsal for every fairy-lover's favorite play, A Midsummer Night's Dream. (Not that I'm playing a fairy. I have firmly established myself as a weirdo clown in local Shakespeare productions.) Mr. B has discussed plans for an awesome semi-permanent fairy playhouse, but time and weather and money need to be on our side. But waaaaahhhh. Get over it, D.
Let's capture the mood with a book instead, shall we? I was so excited when I saw teaser illustrations for A Fairy Friend on Claire Keane's Facebook and Instagram. My family adored her picture book debut Once Upon A Cloud. A former designer for Disney (Tangled and Frozen), her art reminds me of classic old-school animation. I think her faces look characters from a deleted scene from Fantasia. We have been stuck indoors since Monday, so we're very behind on our fairy house and garden construction. I am well-stocked on crafting supplies, though, so we just made more flower fairies for our branch tree! You can never have too many, and they're fun little props, too. 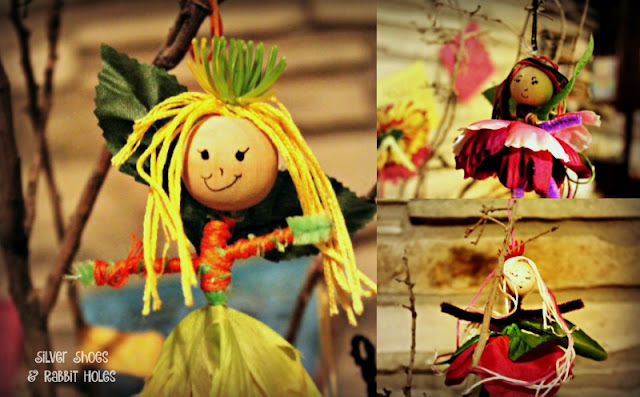 For more on our little faux fairies, see last year's Fairy Day post. I must see this! I must own this! Or gift this! I tell you, this lady is knocking them out of the PARK with her books, don't you think? I think her art is the most charming to come along in maaaaaaannnny a day!